Resodding and reseeding in the big dog section of the Sepulveda Basin Off-leash Dog Park (SBOLDP) begins this month, according to Jorge De Loera, senior park maintenance supervisor for the Los Angeles Recreation and Parks Department. 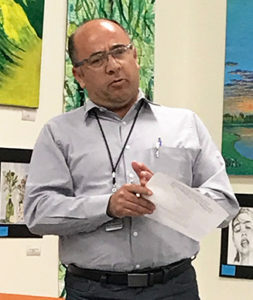 Jorge, who is responsible for 100 dog parks in the west San Fernando Valley area, spoke at a meeting of the Friends of the SBOLDP on Tuesday, March 19, at the Reseda field office of Los Angeles City Councilman Bob Blumenfield. Work on the eastern section of the small dog section will begin this month as well. The bare patch will be reseeded and closed to use for six to eight weeks, Jorge said. Dogs and their owners will still be able to use the western side of this section. Access will be through a fenced-off area of the big dog section to an existing gate on the northwestern side of the small dog section. Work on a large section of the lawn in the timid dog section will begin in June for four to six weeks, he said. Even as the rejuvenation of the grassy areas of three sections of the park goes on, regular maintenance will continue as scheduled: All three sections will be entirely closed up to 11 a.m. on Fridays. The department is also planning to put concrete pads under the new benches in the park. Despite our rainier than usual winter, no changes have been announced in the City of Los Angeles’ watering schedule. Jorge said the park would be watered on an as-needed basis using the three-day-a-week schedule the city requires for residential property.